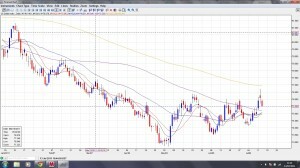 Following two months of sideways consolidation the dollar index is now approaching a key technical level on both the daily and weekly charts, and coupled with various other signals the next few days could dictate the future direction for the dollar and consequently the major currency pairs during the summer months. So, the first point to note is that we are now approaching a key breakout level at the 76.50 area which is a well defined level of resistance which promoted the sharp pull back of late May and early June and, to date, has also proved a barrier to short term rallies throughout June. However, following yesterday’s strong rally for the dollar in the wake of an escalation of the sovereign debt issues in Europe, this has helped to push the dollar index back to test this level once again today, and any break and hold above this price region will then provide a potentially strong platform of support for a sustained move higher for the dollar.This upwards momentum is further confirmed by the series of higher lows, established in early June and followed by a repeat in early July, suggesting, once again, a bullish trend for the US dollar and, indeed, this is further confirmed by two other technical signals. First, yesterday’s price action broke and held above the 100 day ma, which is always a strong signal, and second, the chart is now forming a strong pennant pattern which will reinforce any breakout to the upside. The only technical issue that now remains to be resolved is the 200 day moving average, which sits at the 76.95 price point and should we see the index break and hold above this level then this will complete our technical set up for a strong bullish breakout. The weekly chart for the dollar index also confirms this bullish picture and, here once again, we can see a pennant formation now developing, and a break and hold above the 76.50 will confirm the present bullish sentiment. Finally on the weekly chart the 40 week moving average is sitting immediately above at 76.88 and this will need to be breached to provide additional support to any move higher. Beyond this level we can then look to a move to re-test the underside of the resistance which sits at 78.73 where this also combines with the 100 and 200 week moving averages and should this level be breached then this will add a further dimension to the trend. Finally, from a fundamental perspective, of course, we have the ongoing sovereign debt issues in Europe and later today the release of the FOMC minutes, either of which could provide the catalyst for further dollar strength.